Providing you the best range of cnc lathe trainers with industrial control, cnc lathe trainer kit, cnc lathe trainer, educational cnc lathe tutors machine, educational cnc lathe trainer and cnc trainer lathe machine with effective & timely delivery. With our expertise in the respective domain, we are engaged in offering Prototype CNC Lathe Trainers, which is provided with table locking facility with stepper motor brakes. Known for their alarm & self diagnostic functions, these trainers can be directly linked to PC, thereby loading of program on micro-controller is not required. Besides, the trainer can also automatically detects wrong steps in programming. With our expertise in the respective domain, we are engaged in offering CNC Lathe Trainer Kit, which is provided with table locking facility with stepper motor brakes. Known for their alarm & self diagnostic functions, these trainers can be directly linked to PC, thereby loading of program on micro-controller is not required. Besides, the trainer can also automatically detects wrong steps in programming. With our expertise in the respective domain, we are engaged in offering CNC Lathe Trainer, which is provided with table locking facility with stepper motor brakes. Known for their alarm & self diagnostic functions, these trainers can be directly linked to PC, thereby loading of program on micro-controller is not required. Besides, the trainer can also automatically detects wrong steps in programming. With our expertise in the respective domain, we are engaged in offering Educational CNC Lathe Trainer, which is provided with table locking facility with stepper motor brakes. Known for their alarm & self diagnostic functions, these trainers can be directly linked to PC, thereby loading of program on micro-controller is not required. Besides, the trainer can also automatically detects wrong steps in programming. 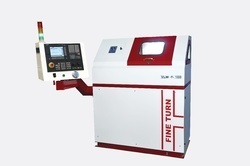 With our expertise in the respective domain, we are engaged in offering CNC Trainer Lathe Machine , which is provided with table locking facility with stepper motor brakes. Known for their alarm & self diagnostic functions, these trainers can be directly linked to PC, thereby loading of program on micro-controller is not required. Besides, the trainer can also automatically detects wrong steps in programming. With our expertise in the respective domain, we are engaged in offering Low Cost CNC Training Machine, which is provided with table locking facility with stepper motor brakes. Known for their alarm & self diagnostic functions, these trainers can be directly linked to PC, thereby loading of program on micro-controller is not required. Besides, the trainer can also automatically detects wrong steps in programming. With our expertise in the respective domain, we are engaged in offering CNC Trainers, which is provided with table locking facility with stepper motor brakes. Known for their alarm & self diagnostic functions, these trainers can be directly linked to PC, thereby loading of program on micro-controller is not required. Besides, the trainer can also automatically detects wrong steps in programming. 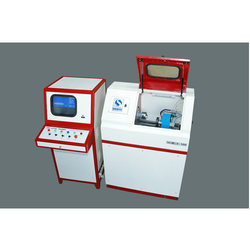 With our expertise in the respective domain, we are engaged in offering CNC Lathe Trainer Machine for CAD CAM Lab, which is provided with table locking facility with stepper motor brakes. Known for their alarm & self diagnostic functions, these trainers can be directly linked to PC, thereby loading of program on micro-controller is not required. Besides, the trainer can also automatically detects wrong steps in programming. With our expertise in the respective domain, we are engaged in offering Educational CNC Lathe Machine, which is provided with table locking facility with stepper motor brakes. Known for their alarm & self diagnostic functions, these trainers can be directly linked to PC, thereby loading of program on micro-controller is not required. Besides, the trainer can also automatically detects wrong steps in programming. 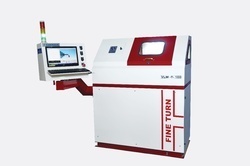 Looking for CNC Trainer Lathe Machine ?